The day finally arrived! Looking back the last one month, I feel that we have come quite a distance, both figuratively and physically. The walk of 400 km has not left us exhausted as I had initially presumed. It has also been a journey of self discovery. The simple lifestyle, the absence of TV and newspaper, the lack of basic facilities, interactions with thousands of people have all taught us so much. Most importantly, they have reinforced our faith in the innate goodness of mankind. It also gave me personally, the time and space to look within. This provided me with the opportunity to see things as they were and not as I wanted them to be. How we create conflicts within ourselves! We are all the time battling our own inner selves and then successfully blaming the situation or the society for all that is going on within and around us. Life would be so peaceful, if we could find understand and appreciate that all external conflicts are a manifestation of the confusions and agitations within. Many of our friends and well wishers joined us on this day. 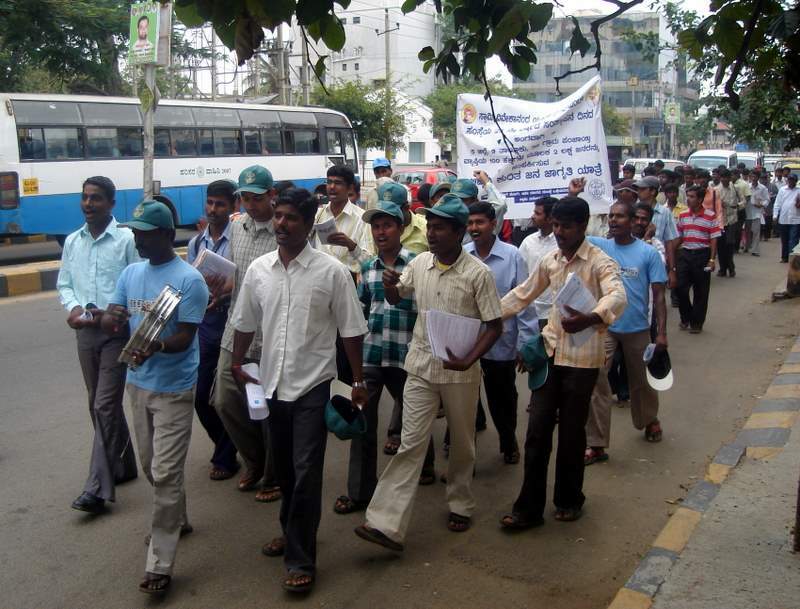 Many walked with us while some joined us at the Gandhi statue. Mr.Nikhil Dey from MKSS, Rajasthan also walked with us. Nearly 300 of us walked the 7 km distance on the last day. We reached the Gandhi statue on MG Road at 12.30 p.m. as planned. We had a wonderful and emotion charged function. Justice M.N.Venkatachalliah was his usual inspiring and witty best. The function was compered by Dr.M.A.Balu and started with excerpts from the Kannada translation of Swamiji’s ‘Song of the Sannyasin’. 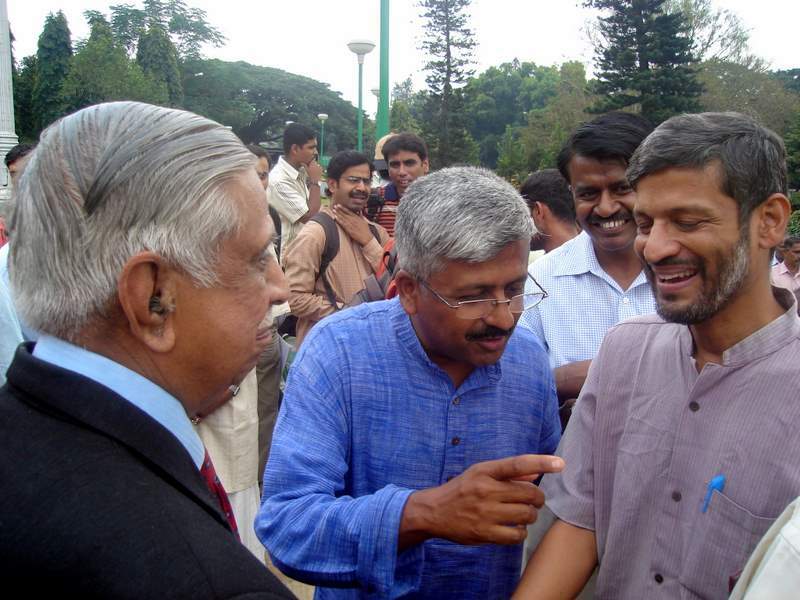 We also sang the Kannada version of ‘Where the mind is without fear…’ from Tagore’s Gitanjali. I spoke on the act, how it can transform India and its rural areas, how we can use it as a tool to bring in development and good governance. 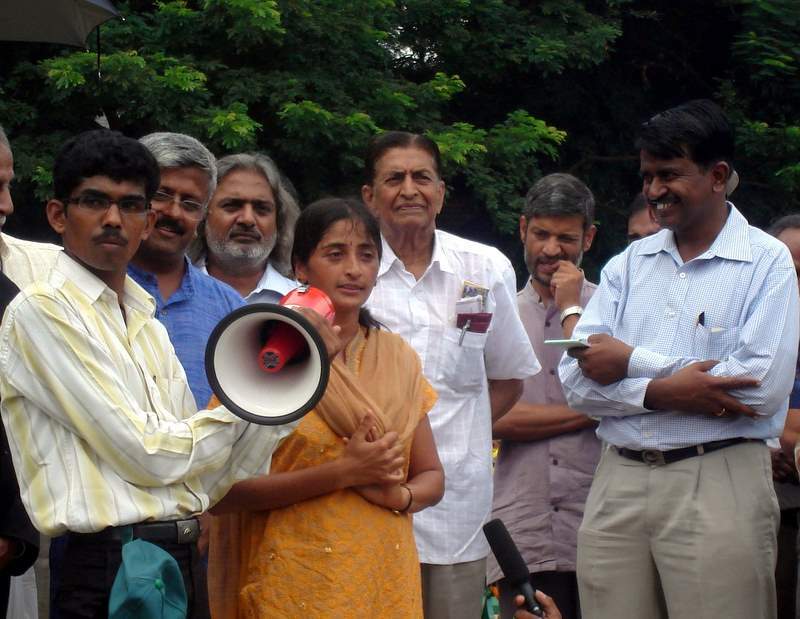 Poshini spoke of her experiences and her perspective on how the act can affect the common man’s life; Mr.Madangopal, the Health Secretary read out a passage from the article on Satyagraha by Gandhi. Justice Venkatachalliah spoke on how this Yathre has restored his faith in societal transformation. Nikhil Dey spoke on how activists worked tirelessly for more than 10 years to get this act enacted and how we need to be watchful to ensure that the act is implemented both in letter and spirit. 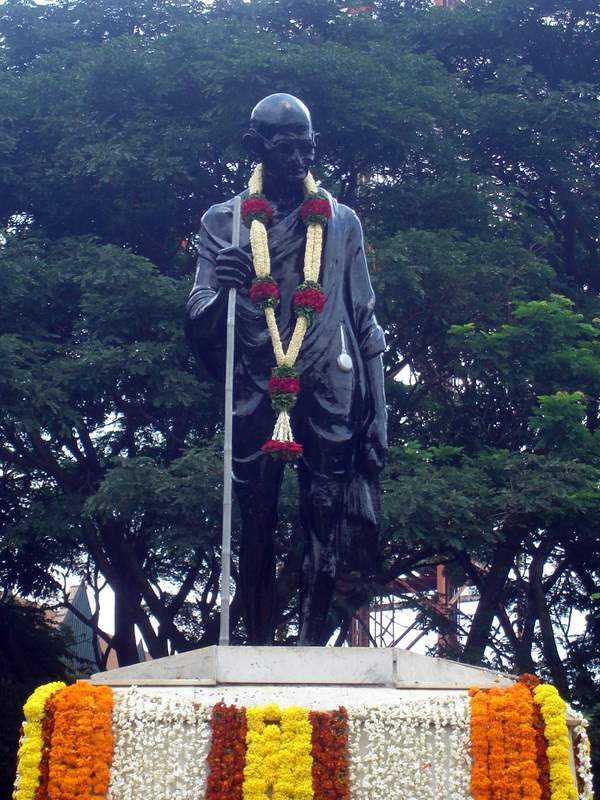 This is the first Gandhi Jayanthi that I celebrated with the people I admired, adored, respected and loved. This was the first time that the event meant so much to me. The goodness in the air was palpable. The hope and expectation that we have generated by this walk needs to now be maintained and raised. How wonderful it was to see people of all ages and all walks of life come together and feel so positive and hopeful! … Finally, all good things should come to an end. But this was never an event meant to have an ending. This whole struggle has been scripted to be a continuous movement to usher in our basic right to demand good governance. We are no longer going to be satisfied with mere information, we will all work to ensure that this leads to a society that is free from fear; a society where the meekest shall find his voice; where the rule of law is no longer an exception; where every citizen of India shall be proud to participate in its development and play his role in making India a healthy, vibrant, inclusive and participatory democracy.